Today I’m offering this Vintage Rose Silhouette Image! This is a Vintage Black and White Illustration showing a stylized Rose with two sets of Leaves. I think this would make a nice Handmade Card! This one was scanned from a recent addition to my collection, a rare Circa 1941/1942 Printer’s Catalog. Antique Clip Art – Little Boy with Buttons and Bear 12 + Floral Journaling Cards or Labels – Updated! 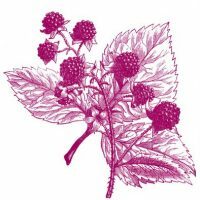 Vintage Images – Luscious Berries Image! Thanks so much for the suggestion Laurkowa!